Maggie is a psychologist with a thriving practice and a devoted husband. Things change when she meets Lakshmi, a young Indian woman who tried to commit suicide. Lakshmi is estranged from her family in India and her days are ordered by her domineering husband. Maggie breaks her own rules and agrees to treat Lakshmi for free in her home office. Those aren't the only protocols that are broken as the two women become friends. But can their friendship survive each woman's darkest secret? The relationship between the two women evolves as Lakshmi shares her loneliness with Maggie. She feels she has no one who cares about her. As the women bond over the early loss of their mothers, Maggie slowly lets Lakshmi into her life as well. Maggie shares some of her insight with her husband Sudhir. He figures out that much of Lakshmi's trouble comes from not having her own identity or income. Maggie and Sudhir help her to start her own cleaning and catering business. The friendship between the two women is lovely and believable until their biggest secrets are revealed. Without giving too much away, I found each woman's reaction rather unbelievable. One of the most fascinating aspects of this book is the way Umrigar tackles racism. Through Maggie and Lakshmi's eyes, we see racism in many forms and realize that everyone has prejudices. When Maggie first visits Lakshmi in her hospital room, the patient visibly recoils. Lakshmi has been taught by her husband that all African-American people are liars and out to get you. Maggie thinks herself above prejudice - she married an Indian man after all. But she slowly realizes her own misconceptions about immigrants and the poor. We are reminded that each of us makes assumptions based on race and class and that getting to know people often paints a much different picture. Umrigar makes some bold choices with this book. Maggie can be selfish and rather brusque. Her husband and, later, Lakshmi are devoted to her. Instead of being appreciative, she is focused on herself. This can sometimes make her a difficult character to like. Lakshmi's chapters are very distinctive because they are written the way that she speaks. It takes a while to get used to her broken and incorrect English. While it can be uncomfortable to read, it really highlights the differences between her faltering speech and Maggie's college-educated, professional demeanor. Thrity Umrigar has written a beautiful and insightful story about the importance of being known and loving people in spite of their failings. 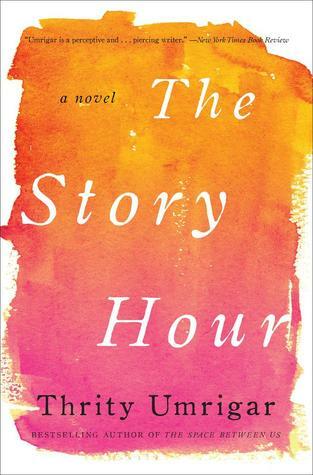 The Story Hour will make you reconsider your own prejudices and the ways in which we perceive the people around us. I read The Story Hour as a part of A More Diverse Universe, where readers commit to reading books by authors who look and think differently than they do. To find other diverse reads, head over to Booklust! I've seen this title around, but I hadn't read a review yet, so thank you for this. It does sound like a really interesting consideration of race and class. My TBR pile is really about to topple over, so possibly I need to avoid adding anything .. . but this does seem like a good read. I found that interesting too. I think, at least in my experience, most of the fictional writing about racism and prejudice seems to deal with the white/black tension. It was fascinating to read about a different pov. Thank you. Good review of an imperfect book with a great message. I will need to find out more about it before deciding but I enjoyed reading your review. Thanks Rita! It challenged me to reconsider how I see people. I am looking forward to reading more of her books. This is the first book by Thrity Umrigar that I didn't love. In fact, I didn't finish it, but that being said, I think this book is more commercial than her previous ones, and I hope because of that, it will reach the wider audience that she deserves. Shoot--you've reminded me that I did not finish the book I signed up to read & review for the Diversiverse challenge! Sorry to be the reminder of bad news!! This is only the second book of Umrigar's that I have read. What struck you as different from her previous books? What didn't you enjoy? Thanks for reviewing this one! It's great that Umrigar tackles racism from all fronts - that people can be victims of racism while being racist themselves. I really appreciated it and I think it made the story much more interesting. I thought this book was so incredible! You're right that she makes some bold decisions with her characters. They aren't always likeable. Lakshmi's initial racism and Maggie's self-absorption are definitely not endearing traits. But I ended up empathizing with them both even when I didn't like them, which I think must take an incredible amount of skill on the author's part. I agree completely! They were both really interesting characters to read about.